Hedgerows have been part of the landscape for hundreds of years. Traditionally used in agricultural areas, hedgerows offer many advantages for smaller, more urban properties as well. Hedgerows also provide an invaluable natural service, offering food and shelter to precious wildlife. A hedgerow is a long row of shrubs, often with some trees, that separate one piece of land from another. They were created to serve two purposes—to mark the boundary of a property and to create a barrier to the movement of livestock. However, hedgerows proved useful in many other ways as well. They also protected livestock and buildings from winter winds, added colour and beauty to the landscape, acted as a barrier to soil erosion, created privacy, filtered noise from neighbouring properties and roads, and provided habitat and travel corridors for a great diversity of wildlife. Though an old tradition, they are an increasingly important part of modern landscapes. One of the most valuable benefits of a hedgerow is its support for wildlife. Hedgerows not only provide wildlife with food and shelter directly, but also create corridors that allow wildlife to travel safely between areas of isolated habitat. Urbanization and development continue to encroach on remaining habitat. Hedgerows offer safe passage between these areas for many wildlife species to access the resources they need to survive. The addition of a properly constructed hedgerow can enhance the diversity of birds and other wildlife that will visit your property. Besides adding to the beauty and pleasure that your garden provides, this diversity contributes to the health of your garden itself. Studies of hedgerows have found that those with a variety of shrub and tree species support a great abundance and diversity of birds and small mammals. They also found that the presence of these hedgerows decreased the number of insect and rodent pest species by providing habitat for their predators. A healthy and diverse hedgerow is able to support good populations of insect-eating birds, such as warblers, flycatchers and chickadees, along with a variety of insect predators, such as tiger beetles and ladybugs. Another benefit a hedgerow offers is privacy, something that is often needed in our increasingly crowded urban environments. How wonderful it is to have a backyard that is your own private retreat! A dense row of trees and shrubs can block out neighbours, filter out the sound of nearby traffic, clean the air of pollutants and add interest and life to your garden. 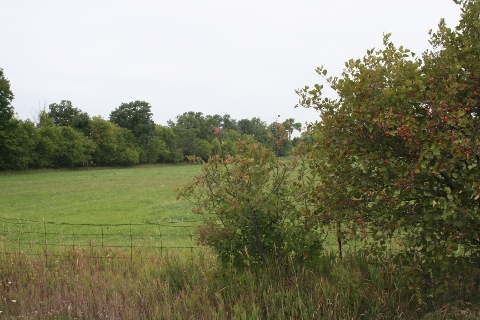 A hedgerow can also help conserve energy. By blocking winter winds, it reduces how much fuel you need to heat your home. A hedgerow is a permeable barrier, that is, it lets some air pass through. Permeable barriers are much more effective at reducing wind speeds than solid barriers such as walls or fences. Air that hits a solid fence passes over it and drops back down quickly, losing only marginal speed. With a permeable barrier, some of the air passes through the hedge and is slowed down considerably. To function as a windbreak, the hedgerow should be planted at right angles to the prevailing wind. In our Canadian winter, winds generally come from the north and northwest. Check with your local weather station for the prevailing wind direction for your area. Diversity is the key to creating a truly valuable hedgerow. Planting a row of cedars, while beneficial, is not as worthwhile as creating a hedgerow that is a mix of shrub and tree species. Put a bit of effort into creating a hedge that provides a diversity of food and shelter for wildlife and you will be more than rewarded for your efforts. The ideal hedgerow is at least three metres wide and made up of two to three rows of vegetation. On smaller properties, a single row is still effective. Examine the site. Determine the light, soil and moisture conditions of the area where the hedgerow will go. Choose plants that are appropriate for these conditions. Determine the ideal height for your hedgerow, considering overhead utility lines and other limitations, and choose plants according to their height and width at maturity. Choose native species as they are best adapted to the local climate, require less care, and provide the best food and shelter for wildlife. Combine the use of both trees and shrubs for maximum wildlife benefit. Choose plants that provide a diversity of fruit, nuts and seeds for wildlife. Add in evergreens, such as cedar, for winter protection and as a winter wind barrier. If young children are not a concern, consider adding thorny species to provide shelter and nesting sites for birds. The best time to plant is early spring, especially if you will be planting bare root stock. You can start site preparation in the fall. Till the length of the row(s) and add organic matter such as compost or composted manure to enrich the soil. Start with some fast-growing species, such as willows, for quick coverage. Add in slower-growing, more long-lived species so they can be established by the time the fast growing species are starting to die out. For a more natural look, don’t plant in a regulated fashion—that is, vary the space between trees. Leave space between the trees to allow them to grow to their full size Fill the space between with shrubs. Spacing between shrubs depends on how quickly you would like your hedgerow to establish. For fast results shrubs can be planted at up to three to four shrubs per metre. However, this may require thinning later on. Shrubs planted at about one per metre will eventually form a solid wall but it may take many years. Consider the width at maturity of whatever shrub you are planting. (For example, a shrub that reaches three metres wide at maturity will expand out 1.5 metres in any direction. If you plant it one metre from the next shrub the two shrubs will be touching when they are mature. Depending on the type of shrub, its size when planted and the site conditions, this may take several years to achieve. The hedgerow should not have any gaps once established. Mulch between rows to control competing vegetation until the trees and shrubs are well established. Water new shrubs and trees regularly until established. Once established, allow woodland groundcover species, such as ferns, bunchberry, or foamflower, to grow in the shade and native perennials to establish themselves in sunnier spots. Add a vine or two as space allows to enhance wildlife shelter. Heavier species, such as wild grape, American bittersweet or Virginia creeper, may require pruning to prevent them from taking over. Replace shrubs and trees as they start to decline or die out. Leave dead wood, leaves and other plant litter as cover for small mammals and insects. Leave standing dead trees as nesting sites where possible. If they cause a safety concern, remove them and replant. Minimize pruning where possible. If you need to prune, consider the best timing according to the specific shrub or tree species, that is, don’t interfere with flowering or fruiting. Don’t prune in spring or early summer when birds are nesting. Fall nuts for birds and mammals. Long lifespan. Pollution tolerant. Subject to storm damage. Lots of seeds. Sun. Variety of soils depending on species. Catkins, buds and seeds food for birds. Browse for mammals. Medium to fast growth. Short lived. Interesting bark. Susceptible to pollution. Sun to part shade, depending on species. Moist, well-drained soil. Summer and fall fruit for birds and mammals. Browse for mammals. Cover for roosting and nesting. Attracts pollinators. Moderate growth rate. Relatively short lived. Beautiful spring blossoms. Nice bark. Sun to part shade. Rich, moist soil. Fruit for birds and mammals. Browse for mammals. Shelter for birds. Attracts pollinators. Fast-growing. Short lived. Beautiful blooms in spring. Fall and/or winter fruit for birds and mammals. Attracts pollinators. Slow to medium growth rate. Medium to long lived. Beautiful spring blossoms. Attractive bark. Many cultivars with varying disease resistance. Sun. Dry to wet soil. Late fall or winter fruit for birds and mammals. Sun to partial shade. Well-drained soil. Fruit into winter for birds and mammals. Favourite nesting site for many birds. Beautiful flowers. Very thorny branches. Sun to part shade depending on species. Dry to moist soil depending on species. Spring catkins and fall nuts for birds and mammals. Shelter. Slow-growing. Long lived. Nice bark. Fall and winter fruit for birds and small mammals. Browse for mammals. Important roosting, nesting and winter cover. Tend to be slow growing and long lived. Many cultivars varying in size. Sun to shade depending on species. Moist, well-drained soil. 18–40 metres in height depending on species. Buds and fall seeds for birds and mammals. Shelter, especially in winter. Slow to medium growth rate. Medium to long lived. Require space. Prefer sheltered locations. Sun to shade depending on species. Soil needs vary. Small to very tall depending on species. Spring catkins and summer and/or fall seeds for birds and mammals. Nesting sites. Fast to slow growing depending on species. Medium to long lived. Most have vibrant fall colour. Fall and winter berries for birds and small mammals. Shelter. Bright spring flowers. Attractive red fruit. Susceptible to insects. Sun. Soil preferences vary among species. Varies with species, but generally tall trees with heights from 15 to over 20 metres. Buds and fall acorns important food source for many birds and mammals. Provide shelter and nesting material for birds and other animals. Long lived. Attractive trees. Many have good fall colour. Sun. Dry to medium, well-drained soil. Varies with species and cultivars. Can reach heights of over 20 metres. Seeds important food source for extensive list of birds and small mammals. Good year-round shelter. Long lived. Medium to slow growing. Beautiful trees. Most require large space. Summer fruit for birds and mammals. Attracts pollinators. Early spring blooms. Good fall colour. Sun. Many shade tolerant. Most prefer moist, well-drained soil. Varies in height and spread among species. Slow to medium growth rate. Long lived. Popular garden tree. Sun. Tend to prefer moist soils but varies with species. Buds and twigs food for gamebirds, mammals and some songbirds. Shelter and nesting sites for birds. Most fast growing and short lived, though varies among species. Versatile. Tendency to block sewer pipes. Food for birds and small mammals. Can be an aggressive spreader. Separate male and female plants. Better fruit production if three or more planted together. Silvery foliage provides nice contrast. Sun to partial shade. Moist to wet soil. Fruit for birds and mammals. Nice white flowers in spring. Good fall colour. Sun to shade, dry to wet, depending on species. Small trees to large shrubs depending on species. Late summer, fall and winter fruit for birds (depending on species). Attract pollinators. Many species have beautiful spring flowers and gorgeous fall colour. Red osier dogwood has bright red stems for winter colour. Summer fruits for birds and small mammals. Fast growing. Showy, fragrant flowers. Sun to partial shade depending on species. Moist, well-drained soil. Food for birds and mammals. Shelter. Adaptable. Doesn’t tolerate strong winds. Light and soil conditions vary with species. Well used fruit for birds and mammals. Valuable shelter. Many species spread aggressively. Some species, such as flowering raspberry, have attractive flowers. Often thorny. Sun to partial shade. Some will grow in shade. Dry to moist soil. Important winter and early spring food for birds and small mammals. Male and female flowers on different plants. Some species sucker extensively. Good for soil stability. Vibrant fall colour. Bright red fruits hold through winter. Sun to shade depending on species. Variable soil requirements. Fall fruit for birds and mammals. Attract pollinators. Many have beautiful, fragrant flowers. Attractive fruit. Site requirements vary by species, some will even grow in partial shade or wet soil. Varies among species but generally 1–2 metres in height. Beautiful flowers. Thorny. Avoid cultivated varieties that no longer produce rosehips or require lots of chemical inputs. Avoid non-native Rosa rugosa and R. multiflora. Sun to part shade. Moist to wet soils. Very showy red berries. Need both male and female plants. May sucker. Sun to partial shade. Dry to moist soil. Need both male and female plants. Aggressive spreader. Sun to full shade. Dry to moist soil. Fruit is fall and winter food for birds. Nesting cover and shelter for birds. Attracts pollinators. Aggressive spreader. Pollution and salt tolerant. Sun to partial shade. Moist soil. Food for birds. Attracts pollinators. Can be an aggressive spreader. Sun to partial shade. Moist, well-drained soil. Seeds for birds and mammals. Dies back each year, but self-seeds for new plants. Sun to full shade. Moist soil. Fruit for birds and mammals. Dense foliage is good shelter and nesting cover for birds. Interesting bark. Drought tolerant. Aggressive spreader. Can suppress other plants.